The World Cup is not just a battle for soccer supremacy. It's also a showdown between two global brands: Nike and Adidas. On that front, it looks like Nike just scored a goal. 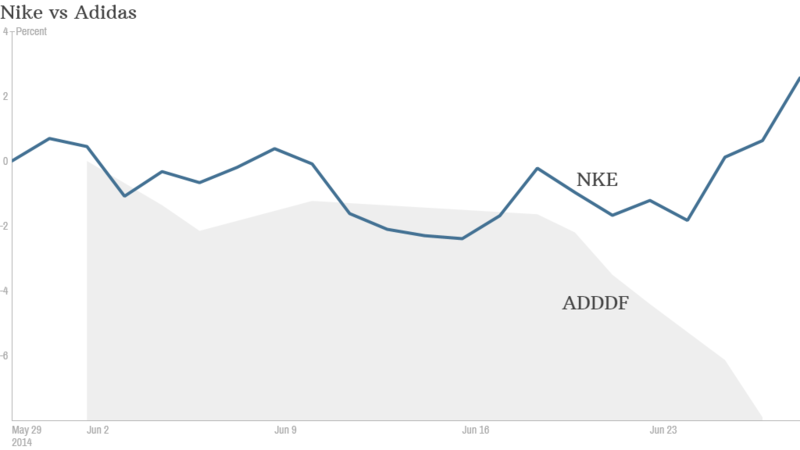 Nike (NKE) shares were up nearly 2% in late-morning trading Friday after the sports apparel company's latest financial results blew past expectations. The world's leading athletic footwear brand said late Thursday that total revenue was up 11% in the fourth quarter to $7.4 billion. 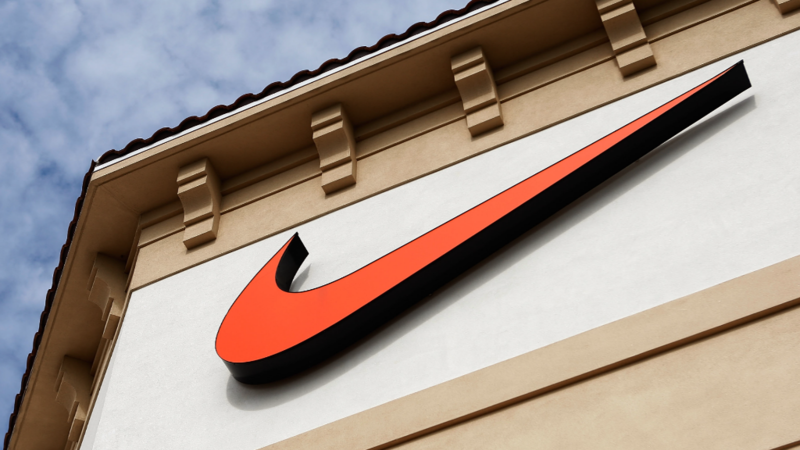 For the full fiscal year, which ended May 31, Nike reported double-digit sales growth in its largest product lines, including running, basketball and women's training. But the company's fastest growing division was football, a.k.a. soccer. 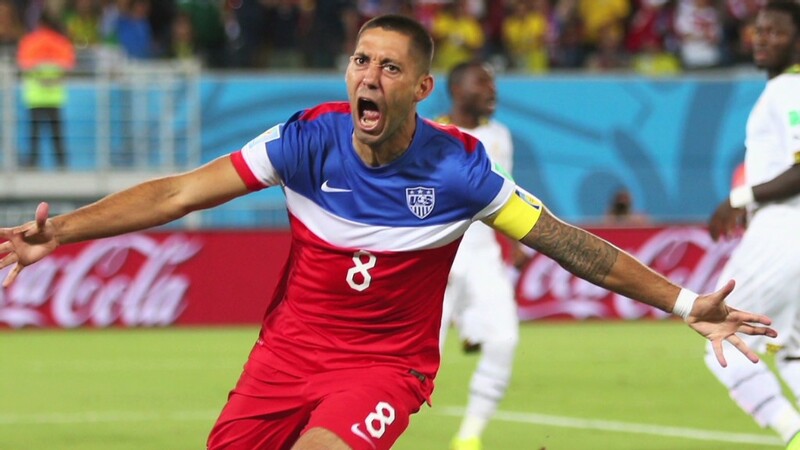 Revenue from Nike's soccer business rose 18% in the company's fiscal year to $2.3 billion. "Our football business has never been stronger," Nike brand president Trevor Edwards told analysts in a conference call. Nike, which started out making running shoes, is a relative newcomer when it comes to selling soccer gear. While it is not an official World Cup sponsor, Nike is on a mission to generate as much buzz as possible at the World Cup, which is expected to break records in terms of viewership. The Oregon-based company currently sponsors the most teams at the tournament. And there are more players in Brazil wearing Nike "boots" than all other brands combined, according to Edwards. "Our comprehensive offense on the pitch and in the marketplace drives our leadership as the world's best football brand," said Edwards. Nike sponsors the U.S. men's soccer team, which lost Thursday against Germany, but still scored enough points to advance to the next round of the tournament. With Nike on offense, it seems that Germany's Adidas is playing defense, at least in the stock market. Shares of Adidas (ADDDF), which trade in Frankfurt and also have a small listing in the U.S., are down 7% since the World Cup started on June 12, though they were bouncing back Friday. Nike shares are up more than 5% over the same period of time. Adidas has set a goal of generating 2 billion euros, or about $2.7 billion, in sales from its soccer business this year. The company will report results for the first half of 2014 in August. Unlike Nike, Adidas sponsors the World Cup at the highest level. It has been an official sponsor of FIFA, which governs global soccer, for decades. Adidas sponsors several teams and has marketing deals with many of the most well-known players in the world, including the Argentinian star Lionel Messi. But team Adidas may soon be down one man. Elsewhere in the sneaker world, shares of athletic shoe retailer Finish Line (FINL) were up nearly 3% on strong earnings. And the company's top competitor, Foot Locker (FL), gained ground Friday too.